MUMBAI: Traffic in Mumbai is pretty usual and a daily routine for most of the Mumbaikars but on Sunday it was quite different. Besides, the regular commotion with rickshaws hustling between speeding cars it was an unusual scene at Azad Nagar right outside the Andheri Sports Complex. Thousands of FC Goa fans trumped to 'Maximum City' to back the Gaurs in their ultimate chase for their dream! Not even a Mumbai cop Sunil Sodgir could do much to help the honking vehicles but just allow the Goans to have a gala time on the street. For once it was felt it was just outside our Fortress -- Nehru Stadium, Fatorda! It’s Indian Super League’s biggest match -- the final -- wherein two of the biggest football clubs clashed and were sure to expect a large gathering and yet was slatted at the smallest venue. However, this didn’t bother much to the Goenkars! Come football and FC Goa, the avowed sports nuts have a big reason to bring out their passion. Under-the-radar activities and the chance to show their love of the game transformed their pilgrimage into an unforgettable experience. The once called “Susegaad” looked electrifying and up on their toes. More than a dozen buses, numerous private vehicles, FC Goa fans took every opportunity to make it to the stadium, while some even took the flight to beat the busy schedule and witness the final. 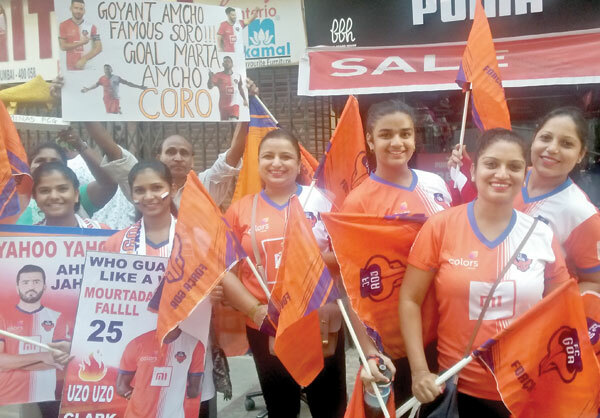 The Goan fans marched towards the football arena echoed the street with their slogans and chants, not forgetting the feel of Goan carnival too with fancy outfits and masks, thus creating an electrifying atmosphere even before the kick-off. 'Hear the roar, we are here to back the Gaurs' read a plaque card by a fan in the stand. Mumbai was set ablaze by “the Uzzo”, a fire that thundered the Mumbai football Arena from the moment the teams took the field for the warm-up. A quick glance at the venue, and none would even say Goa were playing on a neutral venue! A home away from home? "This is a biggest match for us and definitely it doesn't matter how we made it here. I am proud that many Goans made it here to Mumbai to support our team in their ultimate and high octane clash," said Bosco D, a Gaur, who was among the 3,500 odd Goans to make it to Mumbai. The “West Block Blues” were overpowered by the electrifying Goan fans in terms of number as well as the energy. The club which started its journey in 2014 had witnessed largest fan pilgrimage in this final, a probably biggest we witnessed in the league so far.